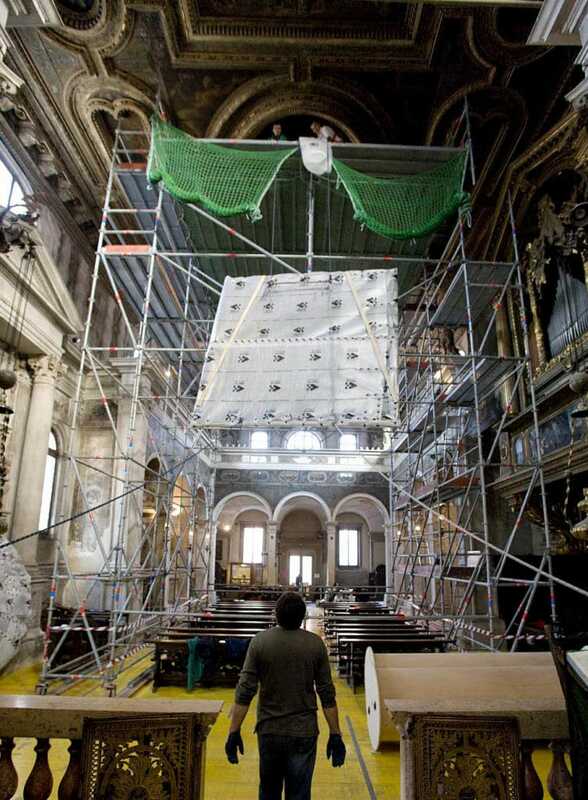 The treatment of the ceiling canvases of the Church of San Sebastiano in Venice was the first step in a project entirely funded by Save Venice Inc. aimed at renovating the entire church. 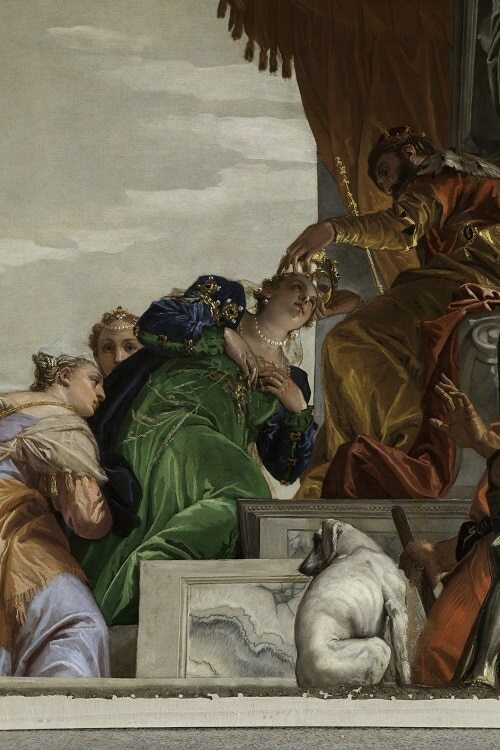 The three works were commissioned from Paolo Veronese in December 1555, and although they are still in their original locations, over the centuries they have been taken down and remounted several times, and have been subject to numerous restorations and other interventions which have affected their appearance. the last of these probably dating to when the canvases were taken out of storage at the Ca’ Pesaro where they had been placed during the First World War. 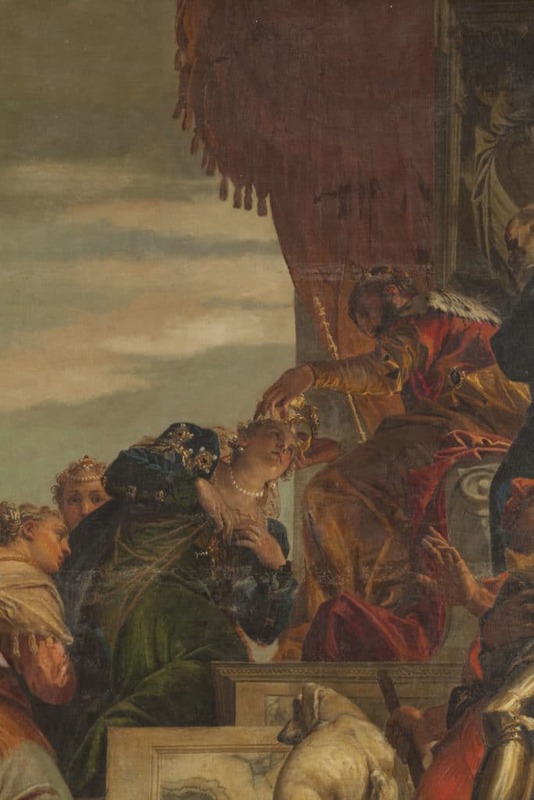 The most obviously restored and repainted areas of the painting are the skies, which Veronese painted in lead white and smalt: sometime before 1832, an attempt was made to re-saturate the colours of these fading pigments by adding thick coats of organic materials which turned dark orange-brown over time. 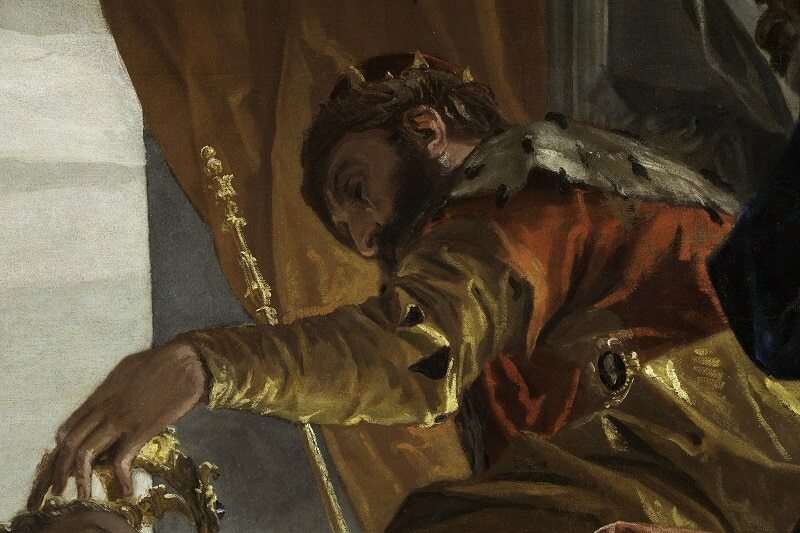 It is difficult to date the many other retouchings and non-original reworkings found on the paintings; these include extensive glazes in bitumen which do not follow the artist’s brushstrokes, covering original yellow highlights and areas painted green. In October 2008 the works were taken down from the ceiling, a complex task requiring the construction of a large scaffolding. 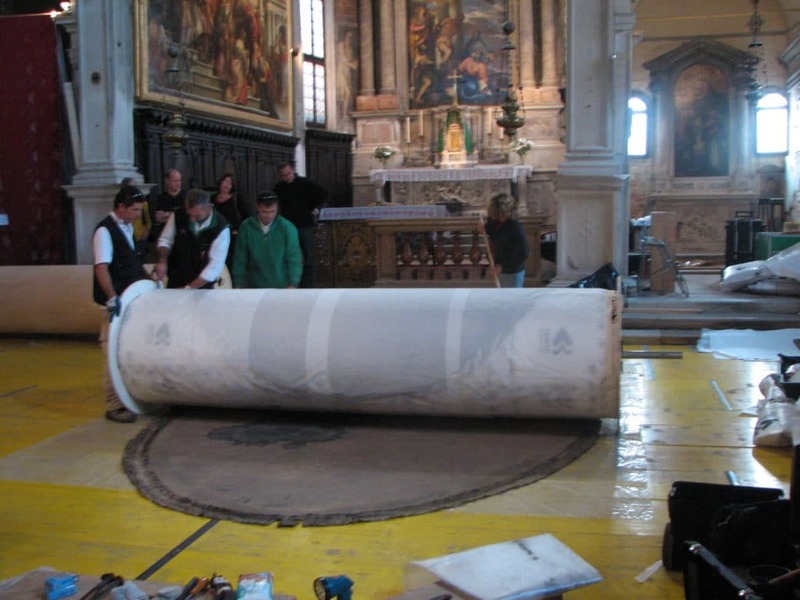 The paintings were placed on large rolls and moved to the conservation studios of the Misericordia for relining and conservation. 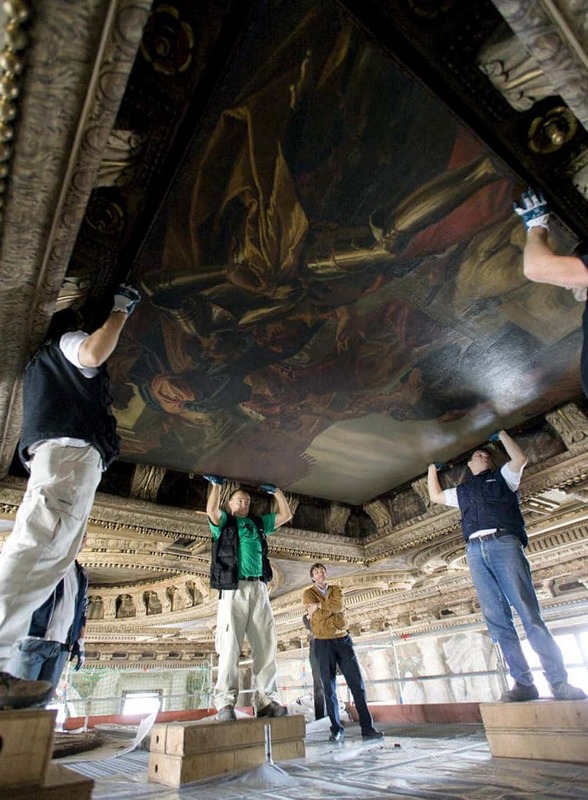 Once the earlier relining canvases were removed, the original supports were found to be free of tears and losses, with all joins in good condition. 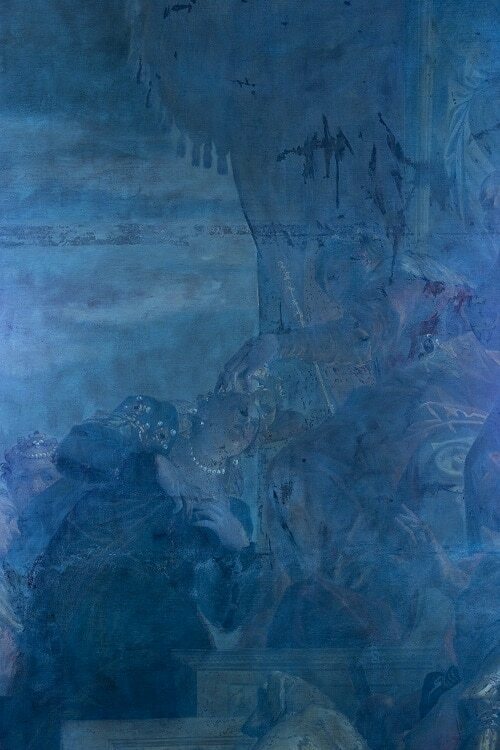 Prior to treatment of the paint layer, the paintings were photographed using natural and raked light and UV fluorescence, documenting the numerous retouchings, including some applied over the varnish layers. 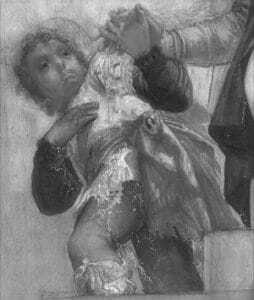 All three paintings were cleaned together, proceeding systematically by starting with the figures and architecture, and removing layer by layer first the varnishes, then the retouchings and the residues of earlier relinings. As the superb original colours emerged, there was an increasingly sharp contrast with the 19th Century repainting of the skies which created flat featureless backgrounds contrasting with the complex shadings of the figures. 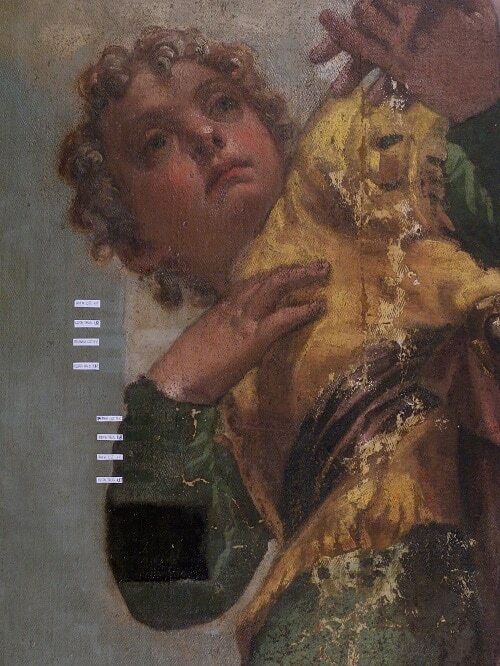 Numerous test cleanings combined with analysis of cross-sections and x-ray imaging supported the difficult decision to remove the retouching and uncover the faded original paint. 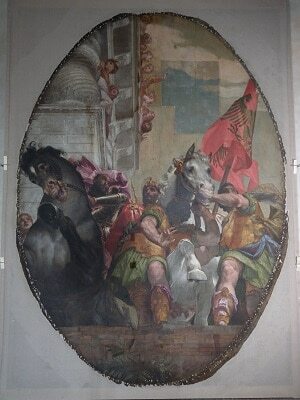 Once the restoration was finished the paintings were exhibited at Palazzo Grimani prior to being remounted in the ceiling of San Sebastiano. Comparing close observation with X-ray and infrared imaging provides invaluable information about original artists’ techniques, from preparatory work to final execution. Infrared images can record traces of charcoal underdrawings but more frequently show preliminary designs done by brush, which can also be seen by the naked eye under more transparent paint layers. Although there are traces of these outlines, the paintings were principally constructed by building up areas of colour, the drawings being used more as a general guide and followed with a certain freedom, which explains a number of small differences between underdrawing and final painting which cannot be really considered as pentimenti. Each shape is first laid down as a thin layer in half-tone colour, using wide, blended brush strokes; on top of this are laid the lights and shadows which build up the volumes. 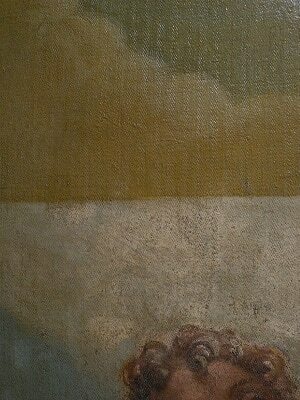 Final rapid touches with dense, almost dry colour give the highlighted details. Co-ordinator: Ornella Salvadori, director of the Scientific Libratory of the Misericordia; XRF and cross-sections: Enrico Fiorin; infrared imaging: Claudia Daffara (INOA Venice); X-ray imaging: Claudio Seccaroni and Pietro Moioli (ENEA Casaccia); binder and canvas fibre identification: Mirella Baldan (R&C Lab., Altavilla Vicentina).